How long should you spend in Rome? Whether you have one, two, three, or four days here's what to see and do in the time you have to spend in Rome, Italy. The panorama from atop St. Peter's dome. I'd give Rome a lifetime—though I guess you could settle for a minimum of three to four days. Then again, I'm not on your vacation schedule, and for all I know you have but a precious day or two to spend on the wonders of the Eternal City. With that in mind, here are several perfect itineraries that'll help you pack as much sightseeing as possible into however much time you have to spend in Rome. 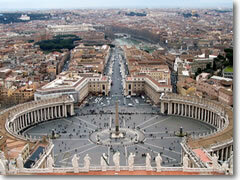 * Itineraries for those arriving in Rome on the morning of the first day. There are actually two kinds of vacation days: days in which you actually do have 24 hours to do everything you want... and days were you have to spend part of the time traveling—either arriving in town, or heading off to the next destination. Most "suggested itineraries" out there assume that you have full days. I travel all the time, so I know that's not always true. Often, you spend the morning of that first day flying in, collecting your bags, going through customs, catching a train downtown, and checking into your hotel. To that end, here are both kinds of itineraries to help you cram the most into whatever amount of time you have in Rome. 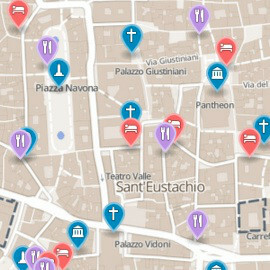 These are the itineraries for those who genuinely have full days to spend in the Eternal City. If Rome is the first stop on your Italian vacation and "Day 1" is the day you are arriving in town, you will spend part of that day just traveling—say, getting from the airport or train station to your hotel. In that case, "Day 1" is really just lunch and an afternoon, and you'll have to adjust your ambitions accordingly. What if I have five days or longer to spend in Rome? I figure, if you have more than three days in Rome, you'll want to start branching out into lesser-known sights and experiences that appeal to you personally—and who am I to tell you what to do? To that end, I've compiled quick lists of both the top sights in Rome and of my own favorite sights and experiences after living there for total of about five years, on and off, since I was 11 years old. You really should spend your time on whatever catches your own interest. Some people would rather get a root canal than spend a day strolling the boutique-lined streets radiating from the Spanish Steps, but for others a day of window-shopping would rank as the highlight of their trip. Same goes for cramming a dozen churches and museums into a single day: heaven for some, hell on earth for others. For some less-famous sights to visit, check out Reid's List: Rome. All these itineraries are designed for the first-time visitor who wants to be sure he or she gets to all the highlights—all the must-sees. But what if you want to avoid the crowds that pack those highlights, or you've already done the Vatican, St. Peter's, the Forum, and the Colosseum and are looking for less famous—but still rewarding—sights? As luck would have it, I have whipped up Reid's List of Rome sights and experiences devoted entirely to this purpose. If you're arriving in Rome by ship (or, more accurately, arriving into Civitavecchia, which is the cruise ship port for Rome but is actually located an hour north of the city), you are not prisoner to the cruise ship's overpriced shore excursions.